Posted by Rob Weigand. This week’s stock market action mainly revolved around one question: Will the federal government have to bail out Fannie Mae and Freddie Mac, the “quasi-private” agencies that buy up and securitize more than half of the mortgage debt in the United States? Following the discussion in the media, it seems that the majority of participants were resigned to hoping for some announcement of a bailout no later than Monday. The market plunged precipitously when Treasury Secretary Paulson proclaimed that there was no need for a bailout mid-morning on Friday. Later in the afternoon, when Senator Dodd of the Banking Committee proclaimed that Fannie and Freddie were solvent, the market perked up a bit, briefly crossing into positive territory before closing with a loss for the day, and (yet another) big loss for the week. You might wonder who would be on the side of not bailing out the agencies if they slip closer to insolvency. The argument for not bailing them out rests on the economic principle of “moral hazard,” which means that if we bail out profligate speculators they won’t learn their lesson and they’ll just regroup and do it all again. And, that’s probably true. In this case, however, the economic consequences of letting Fannie or Freddie fail — or any other large multinational bank, for that matter — are so dire, that there is simply no rational option other than bailing them out if a serious case of insolvency arises. An even more sobering fact is that, even without the systemic failure of one or more large financial institutions (the dreaded “contagion”), the damage inflicted on the U.S. and global economy is already sufficiently serious to retard growth for at least the next year or two. Banks and financial institutions play a critical role in capitalism — they finance virtually all economic growth, literally “creating money” by their decisions to extend credit. Without that lubrication, capitalism “seizes up” like an engine that’s run out of oil. The best we can hope for is that, going forward, players in financial markets regain their senses and realize that we cannot create prosperity simply through financial engineering. Despite the -40% bear market 2000-2002, the stock market bubble of the 1990s never fully popped — it just morphed into a real estate/commodities/global equities bubble when banks used the low interest rate environment to rationalize loans to everyone and everything on planet Earth. Loan creation has got to emphasize better loan-to-value ratios, starting with simple transactions, like requiring 10-20% down on residential real estate, and extending to more complex transactions like credit default swaps. A global value of equities of $50 trillion cannot support $750 trillion in derivatives without inducing wild, unquantifiable risks into the financial system. In a post-modern world, it may be possible to deconstruct a poem or a painting until nothing means anything, but those sorts of rules cannot be applied to banking and finance without running the risk of melting down the entire system. And, even with everyone paying attention to the big mess now and doing their best to fix it (let’s pray they’re not stupid enough to play politics with this situation, although that’s not out of the question, either), we may already be over the edge on this one. I doubt we’re capable of having a Great Depression — world central banks are more sophisticated than in the 1930s — but there is a non-zero probability of a Great Recession. Even if it’s not a steep recession in terms of contraction of the economy, it could be lengthy. A mini-1970s scenario is possible. Equity investors need to brace themselves for what might be a protracted period of below-average returns. Even with the 20% decline in U.S. stocks, relative valuation in equities is not that attractive compared to historical standards. Look at the chart below (from the Federal Reserve Bank of New York). A 1-year trailing P/E of 20.6 is well-above the historical average of 15-16. The rise in dividend yields is encouraging, but 2.4% is still low. 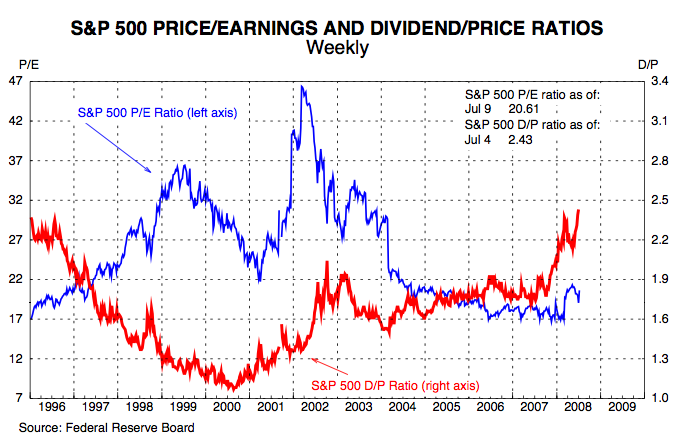 There are only two rational interpretations of these relative valuation ratios. Either future earnings, dividends and cash flows are expected to grow at rates that are well above-average (not likely in this environment), or the expected return on equities is below average. Granted, the equity risk premium may be average (the spread over interest rates, which remain low) — but the raw expected return on stocks remains too low, given the extreme perception of risk pervading markets right now. Stocks are barely fairly-valued, and probably mildly overvalued, even after all the bear market angst. We’re in for more wailing and gnashing of teeth, probably well into fall 2008.
can provide a truly breathtaking cinematic experience. departed and start designing on Torchlight.